The Elf™ Healthcare (HC) PDA is specifically developed for healthcare environments and applications using a chemical resistant plastic enclosure which resists most major cleaning agents. This model capitalizes on the much appreciated Elf ergonomics; the shape and form are designed for human hands. The guitar pick and pen stylus provide additional assistance when entering data, even when wearing gloves. The Healthcare industry is experiencing a growing use of 2D bar codes: wristband identification, exam tracking, specimen bar codes, blood bag traceability, breast milk tracking and medication dispensing. 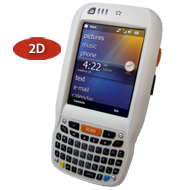 For this reason, the Elf HC has been equipped with a fast and reliable 2D imager able to read a wide array of 1D and 2D bar codes, under most any conditions. To assure the maximum respect of patients, especially in patient bedside care applications, the Elf HC is equipped with Datalogic’s patented ‘Green Spot’ technology and a vibrating alert. Both provide good-read scanning feedback, avoiding noisy and annoying beeps. Equipped with an 802.11 a/b/g radio, it offers a CCX v4 maximum level of security. A Bluetooth® EDR is also mounted on this model, for fast data transfer to printers or other peripherals, avoiding the cables.